By Tim Fletcher: Unbeaten #5 IBF, #7 WBA super middleweight contender Julius Jackson (19-0, 15 KOs) will be in action against #7 IBF Jose Uzcategu (23-1, 19 KOs) tonight in the main event on Premier Boxing Champions on Fox Sports 1 in a scheduled 12 round fight at the Cowboys Dance Hall, in San Antonio, Texas. 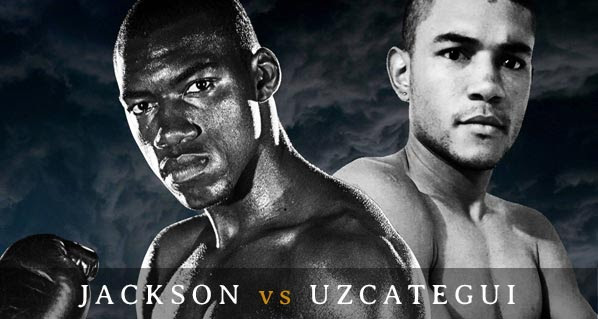 Start time for Jackson vs Uzcategui : @ 9:00 p.m. ET/ 6:00 p.m. PT. This should be a winnable fight for the 28-year-old Jackson, who is the son of former two division world champion Julian Jackson. Like his famous father, Julius has good punching power, although not in the same class as Julian. Julius competed in the 2008 Olympics for the Virgin Islands. Julius has heavy hands, and he’s had little problems beating the level of opposition that he’s been put in with since he turned pro six years ago in 2009. Jackson’s weakness is his slow hand speed and his poor defensive skills. He’s very easy to hit, and he makes things worse for him by retreating backwards and just covering up at the slightest hint of danger. Jackson makes even the easiest of fights somewhat dramatic due to his leaky defense. In Jackson’s last two fights against Jonathan Nelson and Crispulo Javier Andino, he was hit a lot in those fights. You never got the sense that Jackson would definitely win the fight because he looked shaky the entire time. It only stands to reason that if Jackson is struggling to beat the B and C level opposition that he’s been matched up against thus far, he’s likely going to have a lot of problems once he faces his first real test. You can the 6’2” Uzcategu somewhat of a test. He can bang and he’s dangerous, but very wild with his punches and he doesn’t have a high wok rate. Jackson should be able to get past Uzcategu without any problems. but you just never know. As vulnerable as Jackson looked against Andino and Nelson, it’s quite possible that he could lose tonight. Jackson wasn’t doing much working once he got hurt. That’s the reason why he lost. He wasn’t working and he wasn’t holding. He was just trying to run and cover up. Uzcategu was beaten last year by Matt Karobov by a one-sided 10 round unanimous decision. The 24-year-old Uzcategu did not look good in that fight. He looked like a very raw fighter who had just recently taken up the sport of boxing. If Uzcategu had been able to push a fast pace in the fight, he would have had a good chance of winning because Korobov was nothing special in that fight. Uzcategu ended up getting knocked down twice in the 7th round before Korobov gassed out and stayed gassed out for the remainder of the fight. In the co-feature about, 28-year-old former IBF World lightweight champion Miguel Vazquez (35-4, 13 KOs) will be facing Argenis Mendez (22-3-1, 12 KOs) in a scheduled 10 round fight. Vazquez is trying to get back in position to fight for a world title after losing his IBF strap to Mickey Bey last year in September 2014 in losing by a 12 round split decision. Vazquez had problems with Bey’s hand speed and punching power in that fight, as well as his work rate. Vazquez had a chance to win, but he didn’t throw enough punches. He held a great deal and bounced around the ring all night like Viktor Postol did last Saturday night against Lucas Matthysse. Vazquez won his last fight in easily beating Jerry Belmontes by a 10 round unanimous decision last March. The 29-year-old Mendez won his last fight in beating Daniel Evangelista Jr by a 6th round stoppage last February. Before that, Mendez was beaten by former IBF World super featherweight champion Rances Barthelemy by a 12 round unanimous decision in a somewhat close fight in July 2014. It was a close fight and a decent performance by Mendez.